Dear readers — and specifically, dear male readers — today I bring you the belated news that we are right in the middle of Pants Awareness Month. This important month is brought to you by a San Francisco–based company called Cordarounds.com, which — yes — sells pants. But not just pants. All kinds of pants: corduroy pants, seersucker pants, bike to work pants, smoking jackets, and much more. So shocker of shockers, they have a real investment in this campaign. Now, I support a number of important causes (some for very important reasons), and I would hate to see more people be afflicted with any disease known as Sansapant Syndrome. So, count me in. I’d be more than happy to join the fight to find a cure. I hope I can count on you to do your part to stop an outbreak of pantslessness. Please wear pants the rest of this month (at least), and encourage all your male friends and family members to do the same. In fact, why not do a pants check right now? That’s right. Stop reading this post and look down at the part of your body below the waist. Are you wearing pants? No? Well, by all means, go put some on! It doesn’t matter what kind of pants you wear, or what color they are. 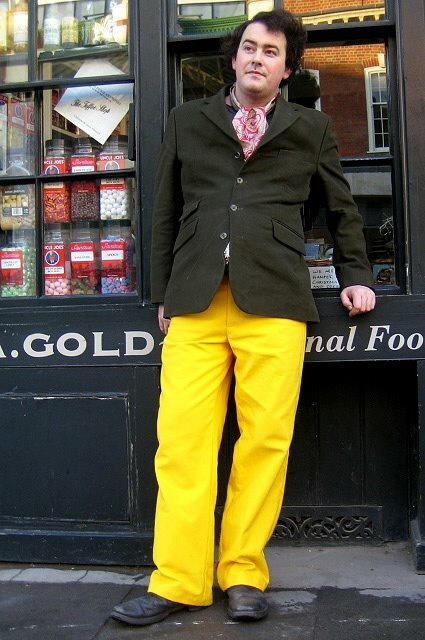 They can even be yellow pants. Just cover your legs. The world will be a better place. And by the way, Wear a Kilt to Work Day — a day when men are encouraged to go pantsless — isn’t until April. So don’t go using that as an excuse.